There are major health benefits to living Gluten Free! Eating a Gluten Free Diet will give you more energy, less fatigued, reduce headaches, eliminate brain fog, fight depression and anxiety, stop itchy skin rashes, muscle and joint pain. 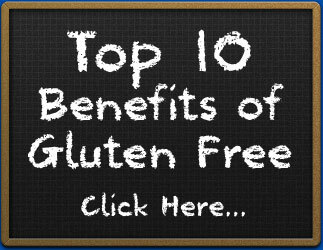 These are only some of the amazing health benefits of not eating Gluten, read my eBook to learn everything! Gluten is a major part of many of the foods eaten and sold around the world. It’s found in countless different items and added to dozens of others. So when you find that you need to give up gluten for health or lifestyle reasons, it can be a difficult to figure out where to begin, and how to maintain your normal eating habits. Thankfully, there are a lot of great substitutes for gluten out there on the market, whether it’s fresh foods that are naturally gluten free, or a variety of foods modified to include ingredients other than gluten. Most people simply assume that gluten is found in wheat and wheat products, and that to avoid it, all you have to do is give up wheat. Unfortunately, gluten can be found in a variety of other foods as well. It occurs naturally in rye and barely, as well as in trace amounts in some types of oats. It can also be found added to everything from shredded cheese to keep it from sticking to soups as a thickener. So when you’re giving up gluten, you need to actively look for foods that are either unprocessed and naturally free of gluten, or you need to look for the words, “Gluten Free” on the label of everything from lunch meats to candy to help ensure the food you are eating is safe. And if you love to cook or bake, you’ll also have to get used to substituting things that you may already use in your home, such as regular pasta for gluten free pasta or traditional takeout pizza for gluten free pizza. Once you get used to looking for gluten in the foods you normally love and enjoy, you’ll soon learn to avoid it easily. Many people hoping to avoid gluten usually begin by preparing everything themselves at home. It’s a lot easier to take control of your diet from home than it is to worry about things like cross contamination in potentially gluten free fast food or restaurants. By cooking at home, you can not only more easily avoid the gluten in foods, you can also learn to prepare gluten free desserts and dishes that are delicious and full of the taste and textures you’ve come to expect in the foods you love. Sometimes gluten free cooking is as easy as substituting one ingredient for another. For example, corn starch makes an excellent thickener to replace wheat flour in things like gravy. Other times, it’s a little more complicated as you learn to navigate the world of gluten free flours and which ones make the best gluten free breads, cookies, cakes, and brownies. Remember that gluten is a protein that plays an important role in traditional wheat flours and baked goods. This extra protein is what binds together things like cakes and pie crusts; without it, they would fall apart. So if you’re making something gluten free for the first time, you either need to determine if it needs the gluten or not. Things like gluten free beer don’t actually rely on gluten to stay together, so other grains can be easily substituted. Gluten free cookies, however, will need some extra protein to make sure they don't crumble. Most people use something called xanthan gum in their cooking to act as a binder. This is derived from corn, however, so if you have sensitivities to corn or corn products, you can also use things like eggs, chia seeds, or different gums like guar gum or gum Arabic. In addition to helping bind foods, gluten helps give them the right texture and consistency. So when you’re using gluten free flours, you may need to blend them together to find the right mix for what you’re making. Many people find a blend of grains and starches – about 70% to 30% gives the right texture, but for things like gluten free cake, you may need to do more of a 2 to 1 grain to starch ratio to get the right results. It can be frightening to think of giving up things like pasta, beer, or birthday cake, but once you take the time to check out the many gluten free options available to you either at the grocery store, at restaurants, or in recipes you can use to make your own food, you’ll soon see there’s nothing to fear. From the many naturally gluten free foods like rice and produce, to the foods you can make yourself like gluten free bread, you’ll soon discover that eating gluten free can be as simple and delicious as eating good food ever was. Gluten Free Expert, Kimberly Scott written this eBook that contains 1000's of hours of Gluten Free Research. She has done all the work, so you don't have to! Get instant access to Gluten Free Meal Plans, Shopping Lists, Gluten Free Recipes, Food Lists and more. Download her Gluten Free eBook now and get new Gluten Free Articles published every week! The information and resources shown on GlutenFreeTeacher.com are not intended as a substitute or replacement for professional medical advice, diagnosis or treatment.